Pittsburgh Steelers linebacker Terence Garvin (57) tackles Cincinnati Bengals punter Kevin Huber (10) during the first quarter at Heinz Field. The Bengals placed punter Kevin Huber on injured reserve Tuesday and signed second-year player Shawn Powell to take his place. Huber suffered a fractured jaw in Sunday’s 30-20 loss at Pittsburgh when hit by Steelers linebacker Terence Garvin during a 67-yard punt return for a touchdown by Antonio Brown in the first quarter. Huber is expected to undergo surgery on Friday to repair the jaw. He also suffered a cracked vertebra, which will not require surgery and is expected to heal on its own, he told the Associated Press on Tuesday. Powell was released by the Bills after a disastrous Week 5 game at Cleveland in which Browns returner Travis Benjamin set a single-game franchise record with 179 yards in punt returns, including a 79-yard touchdown. Powell averaged 46.1 yards on 35 punts for the Bills this season but had just a 35.2-yard net average. He had 10 punts land inside the opponents’ 20-yard line but also had five touchbacks. Powell had a successful rookie season with the Bills in 2012. He averaged 44.0 yards (38.1 net) in 13 games. He had 23 punts inside the 20 and just two touchbacks in 65 punts. He lost out to veteran Brian Moorman in a training camp battle but was called back a month later when the Bills cut Moorman. Buffalo re-signed Moorman when it cut Powell. The Bengals held tryouts on Tuesday. Robert Malone, Drew Butler, T.J. Conley and former Minnesota punter Chris Kluwe were also at the tryout. Powell said he has worked out for Pittsburgh and New England since being released by Buffalo. He was scheduled for a workout with Washington, he said, before Huber’s injury. He got a call from his agent telling him to scrap those plans and get on a plane to Cincinnati instead. Powell drove from Buffalo to Knoxville, Tenn., where he has a house, after his release from the Bills. The drive south also gave him a chance to catch up with his former college special teams coach at Florida State, current UC offensive coordinator Eddie Gran. Huber was fifth in the NFL in net average (41.6) before the Pittsburgh game and had a plus-20 ratio of boots inside the 20 compared to touchbacks (24-4). The Bengals signed him to a five-year contract last offseason. The Bengals want their punters to do a lot of directional kicking, utilizing the sideline, emphasizing the field position battles and not concerning themselves much with how long their kicks are traveling. Huber has excelled at those factors. No penalty was called against Garvin for his hit on Huber, but Tuesday night Dean Blandino, the NFL’s vice-president of officiating told the NFL Network that was a mistake. Punters and place kickers are deemed “defenseless players” at all times when they are on the field, just like a wide receiver who finds himself in a vulnerable position going up to catch a pass. Even if a punter or kicker is involved in attempting to make a tackle on the play, as Huber was, he is afforded added protections. “You can’t hit him in the head or neck, and you can’t use the crown or forehead parts of the helmet to the body,” said Blandino on the show ‘NFL Total Access’. “This is an illegal block. It should have been a flag for a 15-yard penalty… So this will certainly be a point of emphasis this week, especially with our referees who are responsible for the punter on plays like this. Which means that Garvin will be receiving a hefty fine, at the least. During press conferences earlier on Tuesday, neither Lewis nor Pittsburgh head coach Mike Tomlin was willing to speculate on exactly what punishment the NFL would levy against Garvin. 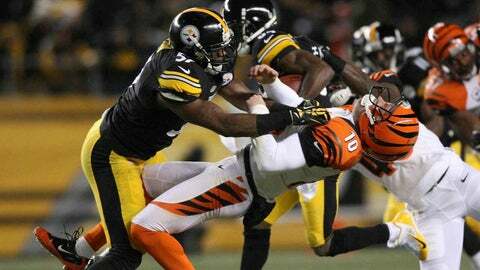 Tomlin told reporters Garvin was in the right spot to handle his blocking duties but went overboard. So it’s a shame that he misses out on the rest of the season and so forth. But he’ll be back and recover and go. We have to watch the punter, he’s defenseless. And we want to flag hits like that.